England play Spain in a Wembley friendly on Saturday – and four of the Spanish squad now ply their trade in England. Liverpool’s Pepe Reina, Chelsea’s Juan Mata and Fernando Torres, and Manchester City’s David Silva could be joined in action by three players who formerly made a living in the Premier League. Gerard Pique was at Manchester United until 2008, his Barcelona team-mate Cesc Fabregas was at Arsenal until the summer of this year, and Xabi Alonso was at Liverpool until 2009. So a third of the best international team in the world – also one of the best international teams in history – play or have played in the Premier League, while most of the rest play at Barcelona (the best team / one of the best teams ever) or Real Madrid (not too shabby either). And yet it has been only in recent times – very recent times – that top Spanish players have opted to come to England during their peak years, and then only a few of them. Torres, Silva and Mata spring most readily to mind, while Liverpool had more than their share of Spaniards under Benitez, and Arsenal and Manchester United respectively acted as Barca nurseries for Fabregas and Pique. The first Spaniard to play in the English league, for any club, Emilio Aldecoa was born in Bilbao in 1922 and arrived in England as a 14-year-old in 1937 as a refugee from the Spanish Civil War. He arrived as one of 4,000 Basque children fleeing General Franco’s fascism. He was a schoolboy striker who attracted attention for a ‘Basque Boys XI’ in late 1937 – and went on to play wartime football for Wolves before playing a season of league football for Coventry as a winger before heading home to Spain. 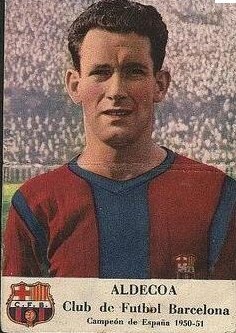 He was capped once for Spain and won two titles with Barcelona during a playing career that lasted until 1954. In the early 1960s he had a spell as assistant manager at Birmingham, and he died in 1999. Jose and Tony Gallego were the second and third Spanish players in the Football League and were also refugees from the Spanish Civil War. Jose was the more successful footballer, an outside forward who played league football for Brentford, Colchester and Southampton. It’s believed that he’s still alive, age 88. He spent 30 years of his post-playing days working as a gas meter inspector in Cambridge. It’s hard to imagine Torres following the same route. Tony had a briefer playing career, as a goalkeeper with Norwich. Berkessy wasn’t Spanish but he had a long association with Spain, worked in Spain for long periods, died in Spain, and almost came to live in England from Spain but was thwarted by the insular mentality of the English authorities and the government. And English football wonders why it didn’t stay as Lord and master of the beautiful game. Berkessy was a Hungarian player (including with Barca) then coach (including with Zaragoza) who was offered a job at Grimsby Town of all places in the mid-1950s. Given the credentials of Hungary in that era (6-3 anyone? ), it might have benefitted the English game to listen to some new ideas. But no. Foreigners taking British jobs wasn’t allowed. (That’s the abbreviated version of a tale you can read in a little more detail here). Foreigners, with exceptions including refugees, amateurs and some Commonwealth citizens, were banned from playing or managing professionally in England between 1931 and 1978. The next Spanish players in the English Football League were Wigan’s ‘Three Amigos’, Jesus, Bob and Issy, AKA Jesus Seba, Roberto Martinez (whatever happened to him?) 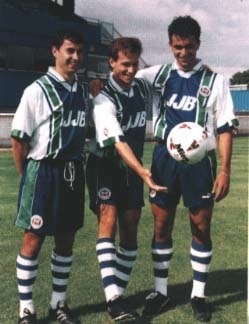 and Isidro Diaz in summer 1995, with lowly Wigan (as they were then). More here. Not a household name. Unless you live in Scunthorpe, in which case he is a legend who served the club with tremendous loyalty and passion from 1996 to 2004. In an era when mercenary Carlos Kickaballs were giving foreign players a bad name in English football, ACG was pootling around North Lincolnshire in his old banger with Spanish plates and scoring goals that will live forever in the minds of Scunthorpe supporters. It is believed he is the author of the only book about football in the Spanish language with ‘Scunthorpe’ in the title (‘Scunthorpe hasta la meurte‘ or ‘Scunthorpe ’til I die’). You can find out more about him in various items linked here. The first regular Spanish international of any stature to play in England while still a Spanish international. Signed for Chelsea in summer 1998 and was part of the landmark Chelsea XI for the Premier League match against Southampton on Boxing Day 1999 that was comprised of 11 foreign players – the first all-foreign starting XI in the 111-year history of English football to that date.